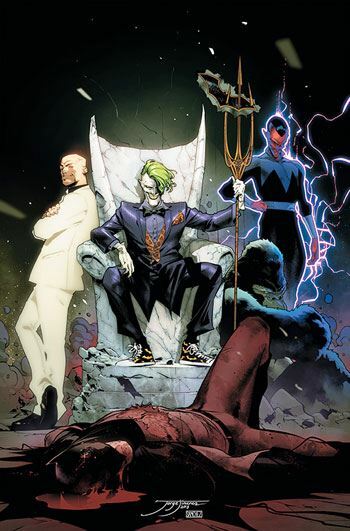 I commented in a review a couple of issues back that the Drowned Earth storyline was putting the Legion of Doom storyline on hold for a few issues. I was wrong. Big time, as it turns out. The latest issue of Justice League is very much entwined with both story arcs. Wonder Woman and Aquaman are meeting with Poseidon, hoping for his help against the alien invaders, but as much if not more time is spent on the villains. We get a great opening sequence, which delves into Black Manta’s past. The Cheetah has some important moments, and Batman faces off with the Joker and some of the other baddies, in one of Luthor’s old super suits. I enjoyed the story, the twists and moments of humour, but in this issue, all of that winds up coming secondary to the art. Frazer Irving and Bruno Redondo execute some really beautiful, evocative work in this issue. The scenes with the Legion of Doom are perfectly good, but it’s the scenes with Poseidon that get exceptionally creative. The visuals are strong, on the verge of disturbing, and very powerful. The art adds a weight to the scenes, which is a darn good thing when you have a god talking with superhumans. An excellent chapter all around, doubly so for advancing two different story arcs at the same time.